The emerging mobile bohemian (or mobo for short) has perfected his or her mobile skills to become more knowledgeable, more spontaneous and more connected. This special edition is a Getting Started issue with basics on just how to perfect your skills and unleash the inner mobo. 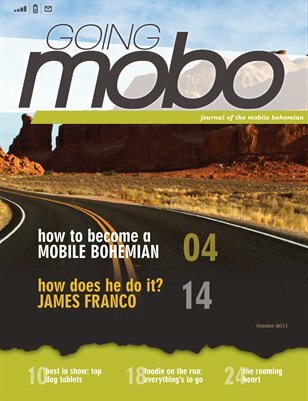 Learn how to become a mobo and the not-so-secret talents of James Franco. If you thought standing in line was boring, try getting to know your line-mates. This issue is packed with recipes and how-to’s.